Who are you, really? Could your beliefs about yourself be real, but not the whole story? Might it be that there's nothing wrong with you, but like everyone, you’ve learned a way of being influenced by the causes and conditions of your life — the circumstances in which you’ve come to be in this world? And that it is possible to learn to live with a greater sense of groundedness and connection, self-compassion, connection to those around you, personal freedom and sense of joy? The invitation is into directly experiencing our lives as they are, not as we imagine them to be, and holding it all with kindness, curiosity, and compassion — what we experience, and, whatever we’re thinking and feeling — without judgment and with compassion. It all starts with arriving in the present moment: a shift in perspective can open a whole new world to wellbeing. I believe that within us, we each have a part of us, deep down, who is quite wise, who we can access to help guide us through our journey. The part of us we’ve pushed down or pushed away that can bring us more clarity and guide us towards taking in more ‘fresh air’ in our lives. Dr. Peter Levine of Somatic Experiencing says, "trauma is a fact of life but it doesn't have to be a life sentence." I know this to be true from my own personal experience. And I also know trauma doesn't have to be what some people have called "big T" trauma - an accident, assault, or natural disaster - it can also be developmental: that our needs as a child weren't met in the way we would have liked and needed to feel safe, seen and soothed — and secure. 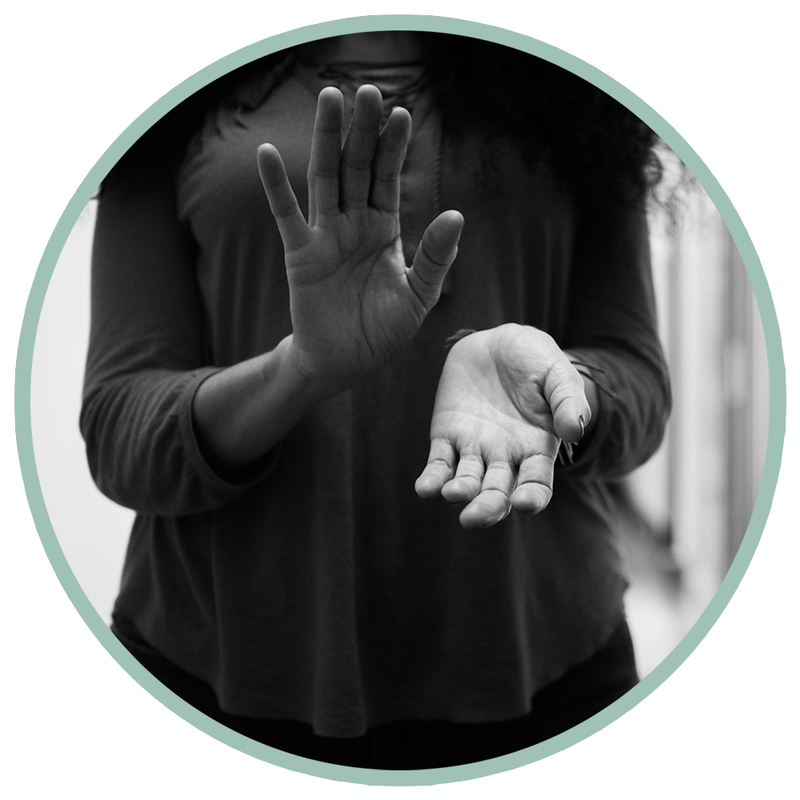 Trauma also doesn’t have to be “obvious” or “invasive” — it can be neglect, or lack of care or the type of care we needed and wanted, when we needed it. Ideally our early caregivers gave us guidance, limits and nurture. But even if they tried and if this wasn’t always the case in the ways we needed — we can come back to our true home. We can help repair these places where there’s still longing, or where there might be shame or rigidity around the pushed down desire for connection and love. When we work with our present moment experiences, we can learn to "titrate" or dip our toe into the water, slowly and gently, through a trusted holding space, to address some of these very young, wounded, overwhelmed, and/or angry and frustrated parts so they can be transformed and healed - and so they no longer get so easily triggered in our daily lives. We can recognize, honor, and dignify what we feel without getting lost in how or what we’re feeling. We can learn to be with our feelings, and not just be our feelings. We can begin to recognize our emotions and name them mindfully from the witnessing place of loving awareness, be they the primary emotions of joy, pain, anger, fear, shame, guilt, love, or variations or new “somethings” that have yet to be named or emerge from within. With mindfulness, we cultivate skills to relate to whatever arises in us and for us in our lives, differently… perhaps inviting in a sense of curiosity and friendliness, instead of exclusively relying on what can often be the familiar, critical inner voice. We learn to understand that critical voice, asking it, what does it want? Why or how has it learned that this is the “best” way to get our attention? When we begin to trust ourselves through these practices, we can begin to know what it’s like to sit with our vulnerable feelings and feel them, allowing them to gently process through, with pendulation and titration, still staying within the window of tolerance and minding the demands and capacities of our nervous nervous system. As “stuck” places begin to release and deactivate, we can return to more regulation and calm. We can tend to these hurt places like we would a baby and then move toward the joy and balance that awaits. We can recognize our common humanity — our needs, desires and wants… our physical, sexual, spiritual, intellectual, and emotional range of our life’s experience, and create enough space to embrace all of it with a mindful, curious inquiry and a friendly, kind awareness. We can co-create this space with the use of mindfulness meditation, through noticing what's happening in the body through Somatic Experiencing and/or creative writing exercises in memoir/poetry. I'm a certified meditation teacher, Somatic Experiencing Practitioner and poet/writer (not a psychotherapist). I aim to deeply listen, support & create a trusted holding space to explore a full range of experience and empower & educate you with information about how the nervous system and neuroscience of the brain works, so you begin to understand you aren't just the "stories" about yourself that you may believe to be true. Mindfulness teaches us to drop into the awareness that is witnessing your thoughts, feelings, and experiences, and asks whether they are the only story. Establishing what’s known as metacognitive awareness, or mentalizing, is key to being with the challenging aspects of our experience in a new way: we become more equipped to relate to our life experiences differently, which can be a portal to transformation. Many of us live in the past or the future. We ruminate and regret, or we have anxiety and worry about what may happen next in life. By learning how to regulate your own nervous system and by understanding what external "triggers" affect you - you can learn to be with and tolerate life's ups and downs in a new way, with fresh eyes, embodied presence, and an open, empowered and courageous heart. By turning towards that which we normally turn against, together we can open up to a new way of being, shifting from anger, fear and grief to curiosity, calm, and courage. We can discuss what you would most like to address in a free phone or video consult and further discuss hourly rates at that time, as well as pay-ahead or “package” plans. I can work with you in person in Brooklyn, and/or via video on Zoom at a time suitable to your schedule. My clients are individuals, couples and groups. They come live and online, from all walks of life. They’re professionals, artists, chefs, activists, organizers, teachers, administrators, creatives, therapists, students, trainers, and more. They span the racial, sexual orientation and gender identity spectrums. Folks come from different socioeconomic backgrounds and lead varied lives. It is my deepest honor and privilege to work with those looking to deepen their practice, expand their capacity for compassionate connection with self and others, engage in the process of transforming their traumas, and begin to shift from surviving to thriving, and to begin reclaiming life’s joys. Sexual Orientation: Inclusive of all sexual orientations, heterosexual and members of the LBGTQIA+ community. Ethnicity: Inclusive of all races and ethnicities. Mindfulness is an invitation to bring a friendly attention and curiosity to your present moment experience without gripping, pushing away, or zoning out. 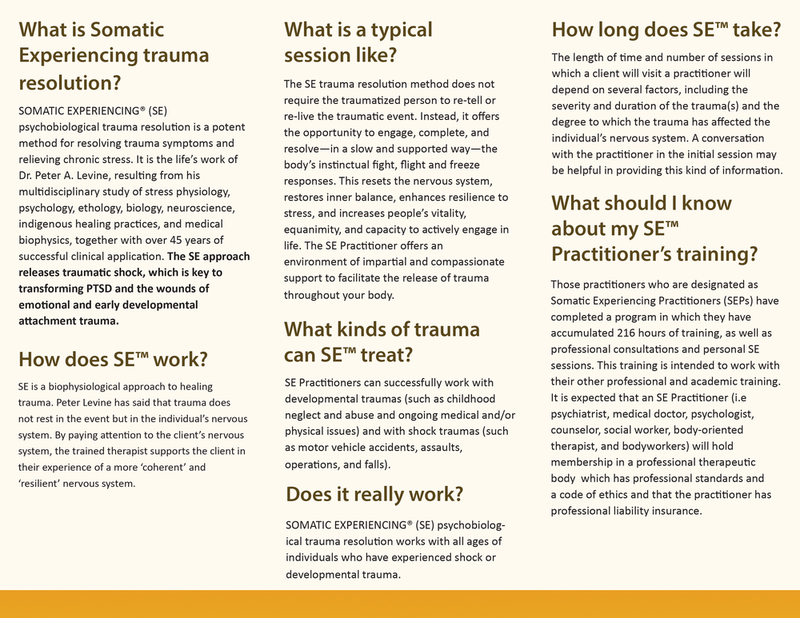 Somatic Experiencing trauma healing is a way to help access the wisdom of the body by helping the nervous system return to balance and calm. Written expression HELPS us create a cohesive narrative out of our lives. By putting our triumphs and tragedies on the page, we open doorways to healing.